Ideally located in the prime touristic area of Mandaue City, Alpa City Suites Hotel promises a relaxing and wonderful visit. The hotel offers guests a range of services and amenities designed to provide comfort and convenience. Facilities like car park, concierge, elevator, restaurant, meeting facilities are readily available for you to enjoy. Guestrooms are designed to provide an optimal level of comfort with welcoming decor and convenient amenities like mini bar, kitchenette, hair dryer, microwave, satellite/cable TV. Access to the hotel’s massage will further enhance your satisfying stay. 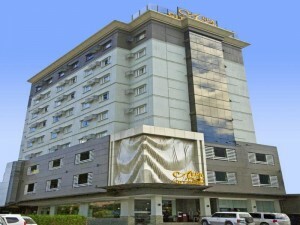 Convenience and comfort makes Alpa City Suites Hotel the perfect choice for your stay in Cebu.